The LDX-D is a DC-powered conditioning module that can accept a wide range of analog inductive transducer types owing to its wide input gain. The signal polarity, span, and offset are adjustable. 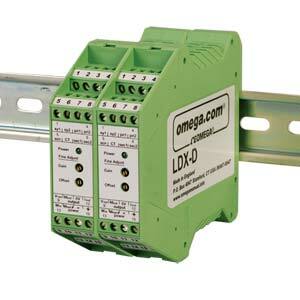 Output is selectable: ±10 Vdc voltage or ±20 mA current. The housing is a standard DIN rail enclosure that can clip directly to a 35 mm top-hat rail (TS35 EN50022). Transducers are connected via the screw terminals on the front of the LDX-D. Internal links and front-panel fine-adjustment potentiometers facilitate setup. By linking 2 LDX-D modules, users can perform some analog arithmetic functions, such as A + B, A B, (A + B)/2 and (A  B)/2.